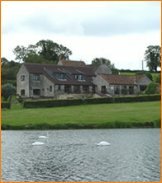 Cameley Lodge set in 60 acres of beautiful countryside, looking out over it's own lake, is a perfect setting for Weddings, Corporate Activity Events, Dinner Dances & Functions or for spending a quiet evening dining in the Restaurant. Situated close to Bristol, Bath, Wells and 6 miles from Bristol Airport it is the ideal location to make your base when visiting the West Country - such historic sites as Stonehenge, Glastonbury, Bath, Cheddar Gorge and the famous Isambard Kingdom Brunel Suspension Bridge at Clifton, Bristol are all within a half hours drive. is served either in the dining room or on the terrace overlooking the lake. Lunch and dinner are always available ( home cooked ). Our lunchtime menu consists of a selection of dishes ranging from steak sizzlers to grilled swordfish steaks, or if you're looking for something lighter, sandwiches, salads or ploughmans are available. A full a la carte menu is available each evening. All the dishes being homecooked, using freshly prepared ingredients. Dishes vary from smoked loin of lamb with mint dressing as a starter to items such as Tournesdos Rossini as a main course. We now have nine, brand new, individually designed ensuite rooms each with their own character and unique features. There's a style to suit everyone. 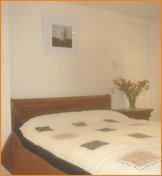 All rooms are ensuite and have TV, direct-dial phone, tea and coffee making facilities, and hairdrier. To make a booking you can call or use our online booking facility. During your stay why not treat yourself to one of our range of activities. We can arrange anything from lessons in fly fishing or clay pigeon shooting to a full round on a local golf course. Although Cameley Lodge is in a quintessential English setting we feel sure that you will want to visit the historical cities of Bristol, Bath, Wells and of course Glastonbury the ancient isle of Avalon. The main function room at Cameley Lodge will comfortably seat 100 guests for a variety of functions from anniversary to Rotary dinners and corporate events. Cameley Lodge has been providing corporate hospitality for over 15 years and has a range of facilities available. Cameley Lodge has been arranging activity events for 25 years and have gained a vast knowledge into types of activities that are available. There are many types of activites to choose from but at Cameley detail is placed on providing a well balanced, fun day that will be enjoyed by all guests - giving each and every competitor quality instruction in a relaxed and personal manner. We have divided specialist activities into groups which are controlled by individuals who have the experience and knowledge to provide you the customer with a standard of the highest quality. With two rooms licensed for civil ceremonies, a tempting choice of hot or cold menus, the organising of music and entertainment and tasteful floral arrangements, Cameley Lodge has everything to ensure that your wedding will truly be an occasion to remember. St James a special room with views of the 13th century church with Norman tower and gargoyles. The ancient paintings in the church depict Monks fishing in the natural spring pools overlooked by this double room.